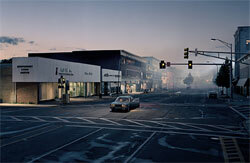 "Crewdson, who cites Stephen Spielberg’s Close Encounters of the Third Kind as one of his most seminal influences, asserts, 'All photographs are unresolved. Unlike other narrative forms, a photo is mute and frozen in time. There is no before and no after. The events remain a mystery.' Of Close Encounters, he notes: 'I hope I achieve a similar tension between wonder and dread in my work.' While Crewdson produces elaborate, Hollywood-scale staged environments that are captured in individual images, Hofer isolates aspects of existing environments, exposing their enigmatic qualities. In both photographers’ work, an inexplicable stillness prevails." Hofer was seen with the rest of the Becher school at Pulliam Deffenbaugh when then opened their new space last fall. Her large scale still lifes are mesmerizing for their balance, sometimes symmetry and unencumbered documentation of architecture and interiors. There is no opening reception tonight, but later in the month Crewdson will give a public lecture at Reed and join in a Ripe family supper.